I was recently able to review a costume from The Costume Super Center. It’s your one stop spot for Halloween Costumes. 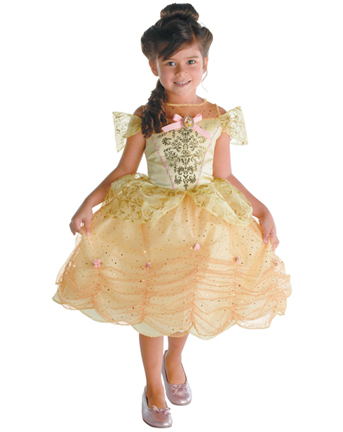 There are tons of different types of costumes to pick from in many different categories. I chose to look at Disney Costumes. It was a tough decision with a 3 year old and 5 year old as we could only get one dress and they (of course) each wanted a different one. I ended up getting the Disney’s Child Belle Costume pictured at left. The girls were ecstatic that they were going to be able to play dress up but I must admit that the dress didn’t quite live up to my expectations. The Price. $20.00 for a costume is amazing. The sparkle overlay was an understatement. It was like opening a can of confetti as the sparkles were just EVERYWHERE for the first 4 days. The front of the dress is longer than the back (which you don’t see in the photo) which seems a little strange to me. The Belle brooch and pink bow that sits at the chest just flops downwards on the dress on both of my girls. It doesn’t show as it does in the photograph. The skirt isn’t as wide as the photo either. I think the photo was a bit misleading. I think the costume would have been perfect for Halloween or a Disney party but doesn’t seem to be made to be worn often as a dress up dress. My youngest daughter wore it every day for 4 weeks and it already has a rip in the sleeve. It’s ripped at the bottom too but that’s because she’s short and she keeps stepping on it. It’s not made for a preschooler to wear it all day for days on end, only taking it off to eat or sleep. The Costume Super Center doesn’t only have costumes for kids. There are adult costumes, “adult” costumes, teen costumes and all types of themed costumes (western, nurses, horror, dance girls, cowgirls, angels, from different decades, TV and movie, witch, tween, Super Heroes, Gothic, Animals and more.